There are many ways to encourage people. One approach is to share positive perspectives on life. It is also to offer practical tools that people can use to follow these principles in their own ways. Different people choose different ways to offer such perspectives. Abraham Maslow studied healthy people and showed how people could enjoy peak experiences. Maria Montessori showed how it was possible to help young people to learn. Kiran Bir Sethi founded Design for Change. This is a global movement that reaches hundreds of thousands of children, teachers and parents. It inspires them to implement their ideas for building a better world. Al Siebert, who wrote The Survival Personality, showed how people could develop resilience and recover from setbacks. Jo Berry, whose father was killed by an IRA bomb, and Patrick McGee, who helped to plant the bomb, now work together to show how people can build bridges for peace. Penny Brohn showed how cancer patients could shape their treatment. She helped to give birth to The Bristol Cancer Help Centre. The work done there has helped many people to develop their inner strength and improve the quality of lives. It is now called Penny Brohn Cancer Care. Educators across the world are helping students to develop what are called the Four Cs of Twenty First Century Skills. These are Critical Thinking, Creativity, Collaboration and Communication. They are helping young people to become more self-managing in an evolving world. Many social enterprises are enabling people to tackle both local and global challenges. These include movements such as The Ashoka Organization, The Acumen Fund, The Unreasonable Group and The Singularity University. Looking at your own life, can you recall a situation when somebody shared a positive perspective that you found helpful? This could have been a friend, teacher, coach or another person. Alternatively it could have been somebody you never met but whose perspective you found helpful. The perspective they shared may have helped you in your personal or professional life. It may have helped you to make a transition, tackle a challenge or work towards your personal picture of success. Describe the specific person who shared a positive perspective that you found helpful. 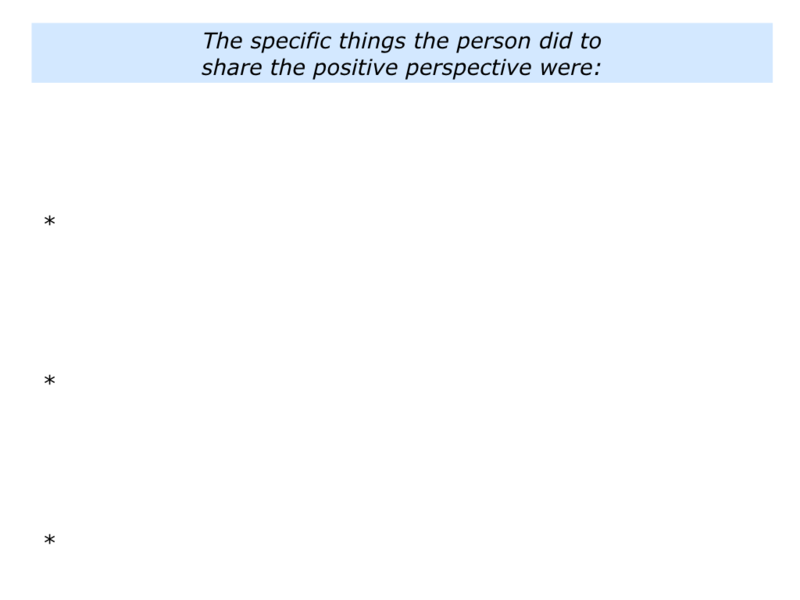 Describe the specific things they did to share the positive perspective. Describe the specific things that happened as a result of you getting help from the positive perspective. 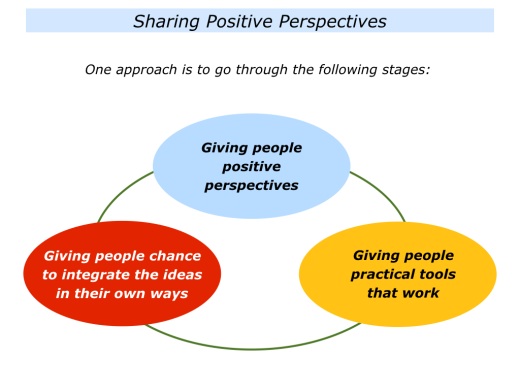 Imagine that you want to share a positive perspective with a person or a group of people. One approach is to begin by asking the following questions. What is the theme that the person or group of people would like to explore? What are the positive perspectives on this theme? What are the practical tools they can use to pursue these approaches? How can I share these positive perspectives in a way that they can accept and use? How can I share the practical tools on this theme? How can I encourage them to, if they wish, pursue these approaches to achieve success? Let’s explore this approach in more depth. Good mentors, for example, listen for the theme in what people are saying. An individual, for example, may want to explore some of the following themes. How can I take more care of my health? How can I encourage my child who is having difficulty at school? How can I do satisfying work? How can I make my best contribution during my time on the planet? A group of people – such as a team or organisation – may want to explore some of the following themes. How can we build a superb team? How can we co-ordinate our people’s strengths and achieve success? How can we build an organisation that gets the right balance between the global purpose and local practice? What is the theme that people want to explore? What do we know works in this field? What are the success stories? What are the positive models and principles that people follow to achieve success? How can I share these in a way people can accept and use to achieve their picture of success? The final question is particularly important. It is useful to recognise the stage were people are on their emotional journey towards finding a solution. Bearing this in mind, you can position the potential solutions in a way they can accept. A person who has just suffered a setback, for example, will not necessarily respond to being told to cheer up. When appropriate, however, they may be open to learning how other people have overcome similar setbacks in the past. There is another approach to enabling people to be open to positive perspectives. This is to invite them to recall when they have tackled similar challenges successfully in the past. David Cooperrider and Diane Whitney built on this approach when creating Appreciative Inquiry. This is a positive model for helping organisations to develop. To clarify how they can follow these principles – plus add other skills – to perform brilliantly in the future. You can follow these principles in your own way to pass on knowledge that people can use in their lives and work. 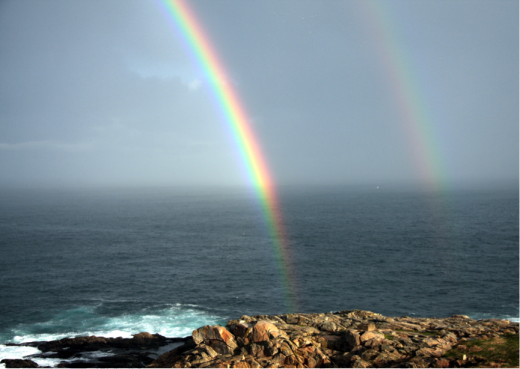 Imagine that you have shared a positive model that resonates with a person or a group of people. This leads to the next step. People often want more than theory; they want practical tools that work. Good educators, for example, start by clarifying people’s picture of success. They then share the potential philosophies, principles and practical tools that people can use to achieve their picture of success. Depending on a person’s goal, there are many practical tools that can be offered. Let’s look at one example. This involves helping a person to clarify their script for dealing with difficult situations. Several years ago I mentored a person whose partner was suffering from a severe illness. As could be expected, both were experiencing an emotional roller coaster. How to deal with such conversations? The approach we explored was for the person to craft a script they could follow in the situation. This would enable them to be polite but also manage their energy. Looking ahead, the person began crafting their script by doing the following exercise. This is one example of a practical tool, but there are many more. You will have your own repertoire of tools you can use to help people to achieve success. Imagine that you have shared a positive perspective that has led to people feeling inspired. You have also passed on practical tools they can use. How can you then enable them to apply these ideas in their own way? One approach is to learn from good educators. 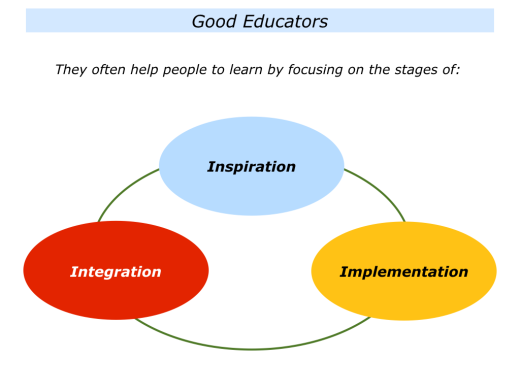 They often focus on the 3 Is: inspiration, implementation and integration. They create an inspiring environment, provide implementation tools that work and enable people to integrate the learning in their own ways. To identify the specific situation in which they want to use the practical tool and clarify their picture of success. To rehearse what they need to do to apply the tool to achieve their picture of success. To apply the tool in the specific situation and work to achieve their picture of success. To reflect on what happened and focus on constant improvement by clarifying: a) The things they did well in the situation and how they can follow these principles in the future; b) The things they can do better in the future and how. To integrate the learning, keep improving and do their best to achieve the picture of success. Let’s return to your own life and work. 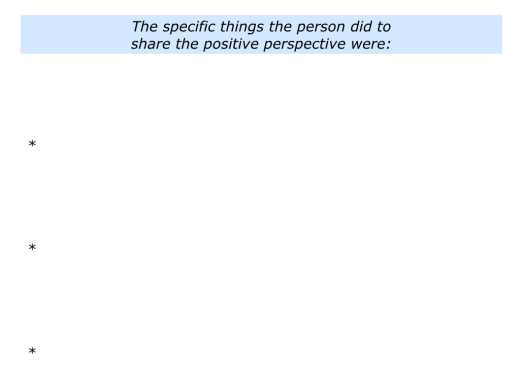 Looking to the future, can you think of a situation where you would like to share a positive perspective with people? This could be in your personal or professional life. Who would be the people – the person or group – with whom you might to like to share such knowledge? What might be the theme they would like to explore? What may be the positive perspective you could share with them? How could you share this in a way they can accept and use? What may happen as a result? Describe the specific situation in the future when you may want to share a positive perspective with a person or a group of people. 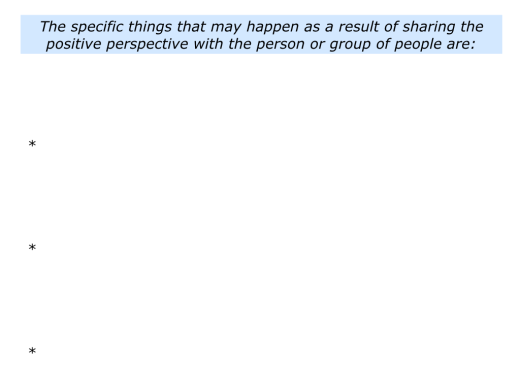 Describe the specific things you can do to share the positive perspective. 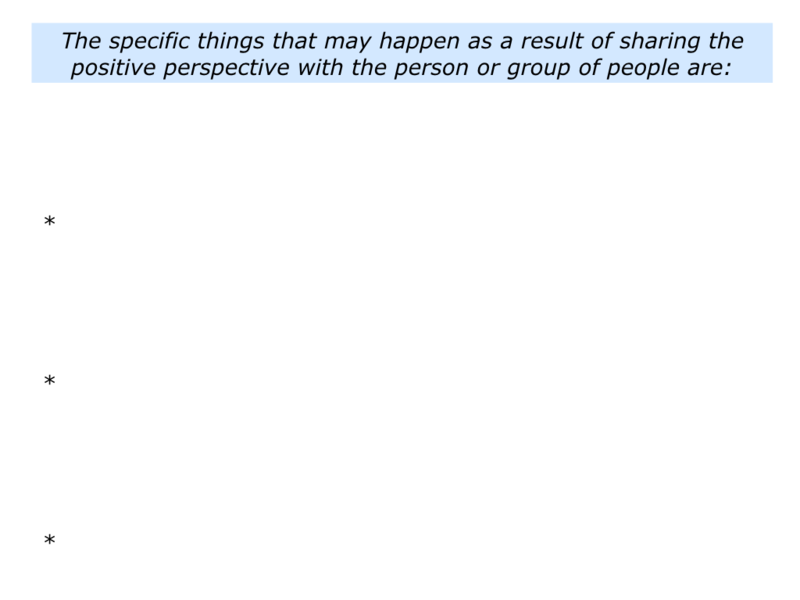 Describe the specific things that may happen as a result of you sharing the positive perspective with them.